I Bet I Can Fill My Bag Faster! I thought today was going to be just another day at work. The internet stops for no one! Don’t get me wrong, a year plus into my job and I still love it, but it wasn’t just another day in the office. Today the Red Cross came into the office to set up for a blood drive. I’d never donated before, but I signed up and they told me I could do a double red cell donation. 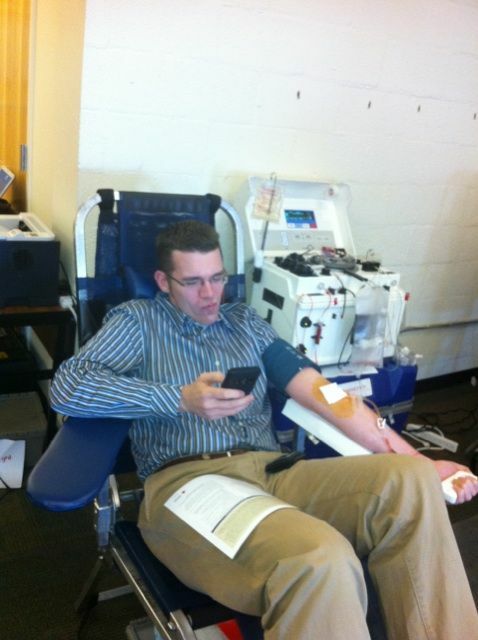 After I was done donating I had some juice and cookies and went back to work. I knocked a few things out and cut out early because I was hungry and kind of tired. So I sat and looked at the little red spot on my arm and thought about what I did. All I really did was sit there and make goofy faces and joke around a little because I was nervous. It’s what we talk about a lot at The Job, though. We’re trying to get people to look at volunteering in a new light and this is one of the ways we can do it. The simple act of sitting in a chair for a little bit helps people. It helps people who are in no position to help themselves when they need the help that I gave them. So, today was a pretty awesome day at work. I’m excited for tomorrow.